The pipe organ was built by the English firm, FW Nicholson and was originally installed in the Independent Congregational Church, Malvern Road Prahran, in 1861. 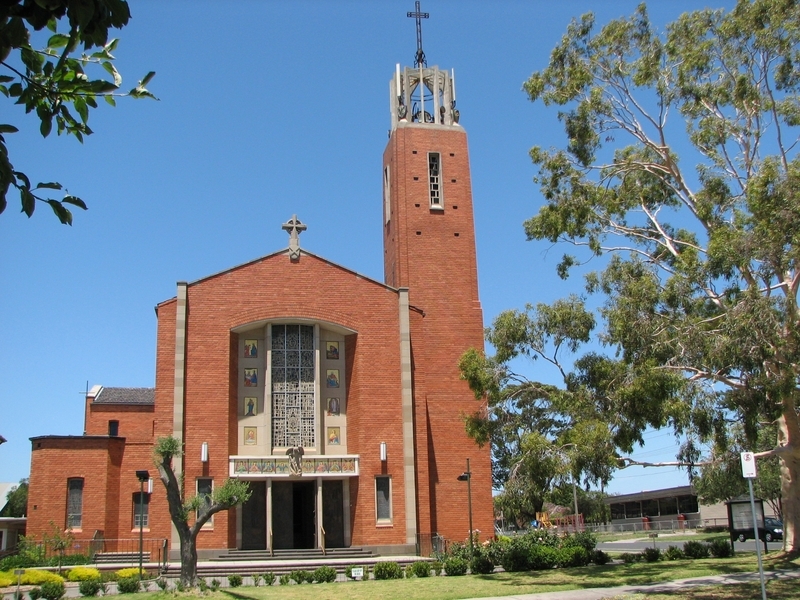 Following the sale of the church to the former City of Prahran in the 1980s, the organ was donated to St Patrick's Mentone where it was recommissioned in 1999. The St Patrick's pipe organ is of historical, scientific (technological) and aesthetic significance to the State of Victoria. The pipe organ at St Patrick's Mentone is historically important as the only example of an FW Nicholson imported into organ in Victoria, and the largest such instrument remaining in the world. The organ is historically important because of the survival of its original pipework, the largest and oldest corpus of pipework extant in Victoria. The aesthetic importance of the organ is demonstrated in the richness and diversity of the ornate stencilled decoration on the organ?s facade display pipes which was applied in 1862, one of the earliest examples of this type of work in Victoria. The design and scaling of the organ is important and illustrates the strong influence on Nicholson's work of the renowned German organ building firm Shulze. To the extent of all the structure known as the FW Nicholson organ, St Patrick's Mentone, including the casework, pipes, console, relays, and any windpumps. Several organbuilders operated under the name of Nicholson in nineteenth century England. Although not a lot is known about Frederick Nicholson, he is said to have founded his business in 1830 and his factory was recorded as still operating in Bradford in 1888. Nicholson's later work was influenced by the renowned German organ builder Schulze. The firm, who operated in the nineteenth and twentieth century, exported a number of instruments to Britain. The F W Nicholson Pipe organ was imported by the firm Wilkie, Webster and Co of 15 Collins Street Melbourne in 1861 and installed in the Independent Congregational Church, Prahran. It is the only F W Nicholson organ to be imported to Australia, and is the largest known extant example of Nicholson’s work in the world. In July 1861 permission was given for the ‘singing committee’ to order an organ It was decided to purchase an instrument from Frederick Whitworth Nicholson of Bradford, England. 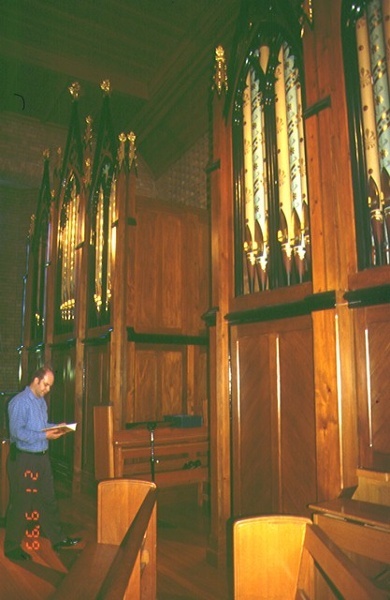 The F W Nicholson Pipe organ was installed in the Independent Congregational Church, Malvern Road Prahran. The organ experienced a degree of malfunction during its first twenty-three years in service, but was not uncommon with imported organs. The timber used in their manufacture had not been seasoned to withstand the excessive heat and sudden changes of temperature during the Australian summer. Very few changes were made to the actual pipework of the instrument over the one hundred and twenty years it was located at the Prahran church, considered quite rare in an organ of this age, although in 1920 the mechanical action of the organ was replaced with a pneumatic action. With constant use the organ gradually deteriorated until by 1984 it was virtually unplayable. During the 1980s Prahran’s Congregational Church (then Uniting) was purchased by the Prahran City Council and the future of the organ became uncertain. The City Council initiated plans for the Church to become a Community Arts Centre (now know as ‘Chapel; off Chapel’) and the Nicholson organ was advertised for sale. After considering a number of submissions the City Council gifted the organ to St Patrick’s Mentone. The organ was restored and opened in St Patrick’s Mentone in 1999. A plaque was placed on the organ noting the instrument’s history and original location. The display pipes, stencilled with an alternating pattern, base colours of light-blue and light-brown with highlights in 24 carat gold leaf, were restored during installation. The stencilling, was applied in 1862, is one of the earliest examples of this type of work in Victoria. The layout of the instrument was reconfigured to enable installation in the gallery of St Patrick’s. The Great and Pedal pipework was located on the east side of the gallery. The Pedal Stopped Bass 16’ and Principal Bass 8’ are in original positions either side of the Great soundboard. As is the Open Bass 16’ placed behind the Great along the gallery wall. The casework and facade is original on this side with pipes from both the Open Diapason and Principal Bass 8’ contained in the facade. The stencilled facade pipes have been meticulously restored. A new electro-pneumatic key action was installed along with new electric stop action. A new console was constructed along period lines built in to the facade on the Great side. It is mainly crafted from oak and finished in a light stain. The drawstops are facsimiles of the originals carved from walnut. The stop labels are made from ivory resin; the lettering style also copied from the original. A new pedalboard, adjustable bench and keyboards with scrolled key checks have been installed along with a combination memory with range set capability and eight memory levels. On the west side of the window is the Swell pipework. This division, originally only to tenor C, has been extended to full compass. Space has been left behind the swell box for the addition of Pedal Trombone 16’ at a later date. The building frame and casework on this side is new as are the zinc facade pipes with the stencilling beautifully duplicated. The manufacture of the facade for the new case represents a magnificent achievement by the craftsman involved, the carving of the gothic arches and finials being In particularly detailed. The casework has been highlighted with 23 carat gold leaf at the tops of the gothic arches. The organ at St Patrick's Mentone is the only remaining example of a F W Nicholson organ in Victoria. The organ's historical importance is enhanced by the survival of its original pipework. The design and scaling of the organ also displays the strong influence of the German organbuilding firm Shulze. The St Patrick's organ is the only example of a Nicholson organ in Victoria. It also comprises the largest corpus of pipe works surviving from the early days of Victoria. The design and scaling of the organ illustrate the strong influence of the German organbuilding firm Shulze. The ornate decoration of the organ's facade display pipes are important in displaying richness and diversity. They are stencilled with an alternating pattern, base colours of light-blue and light-brown with highlights in 24 carat gold leaf. It is noted that the stencilling dating from 1862 is one of the earliest examples of this type of work in Victoria. The Nicholson organ demonstrates mid-nineteenth century English practises in the construction of large organ. The design and scaling of the instrument display the strong influence the German organbuilding firm, Shulze, had on the development of English organs. * minor repairs and maintenace which replace like with like. The importance of the organ lies in its rarity, age and design. No major works should be undertaken without considered, expert professional advice. Day to day reapirs and maintenance which allow the instrument to continue to operate should be allowed without a permit.